Home / Family Life / BODYARMOR an Essential to Your kids sports! BODYARMOR an Essential to Your kids sports! The summer heat is on! It is hot where I live and I know that when kids are playing sports in this kind of weather they deplete their bodies of all of the hydration they have. Their reserves are only so much and this heat along with physical activity just takes all they have. It’s time to rethink your sports drink. Right where it belongs out on the field! BODYARMOR is a premium sports drink that has potassium filled electrolytes, coconut water, and vitamins, the taste is so much better than other sports drinks the kids have tried. I had no problems at all getting them to keep drinking this. Destini is a huge fan of the Blackout Berry fan! I love that there is only natural flavors, natural sweeteners, and no artificial colors, during the summer in the hot weather when we drink quite a few sports drinks it is good to know that we are not filling them full of artificial color and flavors. BODYARMOR not only has an awesome blackout berry flavor, it comes it seven other great flavors, fruit punch, orange mango, strawberry banana, tropical punch, lemon lime, mixed berry, and grape. There is sure to be a more than one that your kids love. Heat stoke and heat exhaustion are real problems in kids playing sports during the heat of the day, and can really sneak up on you and them. 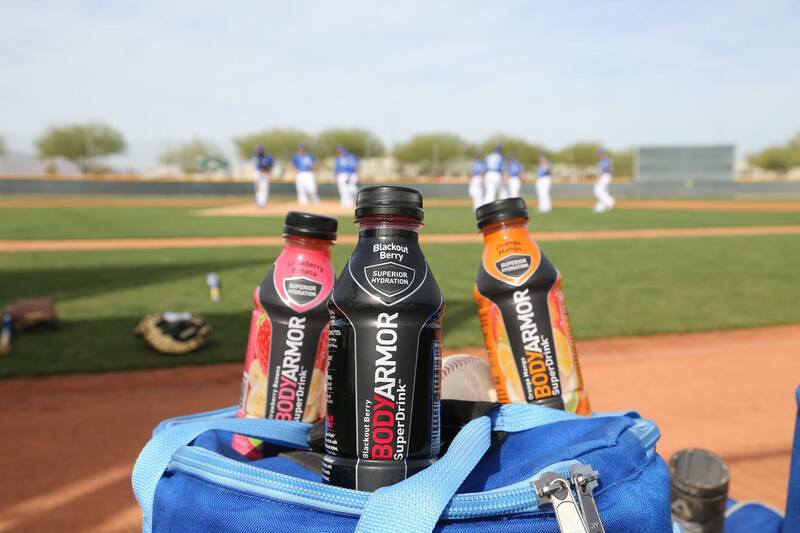 BODYARMOR will help you keep them hydrated, and performing their best, game after game. Heat stroke can be brought on as a direct result of getting dehydrated in the hot sun while doing strenuous activities. In Southern California it is easy to prevent, we just stop at our local 7-11 or Target and pick up BODYARMOR and some ice, fill our small cooler and have it available for the kids, we never have to beg or even ask them to drink it they love the flavors and I know they feel better and play better when they are well hydrated. Richard Sherman Loves his BODYARMOR! Many of today’s top athletes choose BODYARMOR as their drink of choice, including: Mike Trout, Andrew Luck, James Harden, Buster Posey, Richard Sherman, Dez Bryant, Skylar Diggins and Sydney LeRoux. They know it works for them during their professional games and practices. I know your kids are going to love it as much as we do around here and I think you will see a difference in how they feel and how easy it is to keep them hydrated and moving in the heat of the summer! I received compensation in exchange for writing this review. Although this post is sponsored, all opinions are my own.